Richton, MS is in the pine timber country about 100 miles north of the Gulf. In late winter it was heaven, but by July as the heat grows and the sweat flows, it must be very tough country for men and dogs. For March 3 through 5 it was an ideal site and for trackers from the North much more attractive than Miami Beach. There were a total of 17 participants and 5 second adults present. The majority were experienced trackers from Michigan toMississippi with the usual strong contingent from Georgia. For these “old timers” there was much to discuss and stories to tell. The new handlers could learn from both the North and the South, and for them it was an ideal situation for deciding what breed of dog best suited their personal needs. The dogs present included a Southern Black Mouth Cur, Bavarian Mountain Bloodhound, Beagle, Blue Lacy , Corgi/German Shepard mix, Catahoula Leopard Cur, Dachshunds (standard wire and mini smooth) and a Deutsch Drahthaar. On Saturday and Sunday the young dogs and their handlers did tracking exercises in the pine and privet cover, and the judges did their best to give useful advice. On Monday we ran formal four UBT 1 evaluations and six more advanced UBT 2s. Not all of the dogs passed because the cover was quiet demanding. John Jeanneny judged Sue Edwards’ Beagle Roczie in a UBT 2, and found her to be superb. Marlo Riley from South Texas was part of our judging team and added her expertise on tracking dogs that work off lead. Marlo administers Lacy Game Dog Registry and has had extensive experience with this breed that is very important in the Southwest. 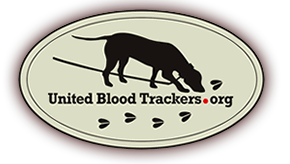 Thanks to her influence The Texas Lacy Game Dog Association uses the United Blood Trackers judging system and UBT accredited judges for their own tracking events. The indoor sessions were held in the Richton Multi-Purpose Building, and even though dancing was not allowed we all had a good time. There was an excellent presentation by Mike Martien on the use of the GPS Astro and other devices for tracking off lead in the South where this is legal. Several speakers spoke on puppy training and the importance of working puppies at an early age while their brains are developing rapidly. UBT Board member Al Wade, who is a veteran tracker, deserves much credit for putting Trackfest 2012 together. He found the Richton site and negotiated for use of the building and lands that we required. Cheri Faust from Wisconsin did a great deal of the on-site organization and record keeping. Everything ran very smoothly.